Does Your Church Have An AED (Automated External Defibrillator)? Why Did We Choose the Philips as the Best AED for Church? Conclusion- Why Should You Buy the Philips OnSite AED Business Package? If your church congregation includes a lot of senior citizens and older individuals, purchasing the Philips OnSite AED Business Package may help save a life. 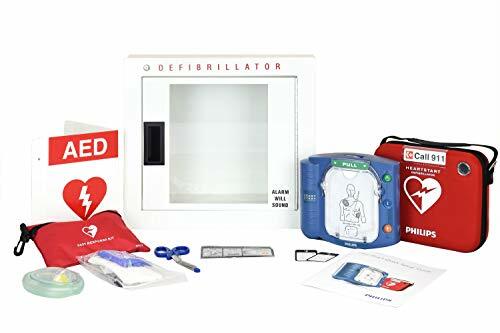 An automated external defibrillator (AED) is a portable device that is used to deliver an electric shock to the heart. These devices are primarily used to restore normal heart rhythm following a sudden cardiac arrest. The Philips HeartStart OnSite AED is a consumer-grade medical device. It is intended for regular people with no medical training. In fact, you do not need any first aid training to use this AED. It even includes voice commands to guide you. You can also purchase training pads to test the device and train your church staff on how to use the AED. If you are concerned about the health of the people who attend your church, the Philips OnSite AED may help give you peace of mind. It is an easy device to use and provides additional protection in case of an emergency. If the AED is too complicated for the average person to use, it may not be effective at saving lives. You need a device that anyone can quickly use to begin providing electric shocks to the patient. For example, the Philips OnSite AED includes large, easy-to-follow illustrations to guide you through the defibrillation process. The reliability of the device is also important. These medical devices should come from a trusted company that has experience in producing high-quality life-saving devices. You should also ensure that the company is still in business. If the company is not around anymore, you may have trouble finding replacement parts, such as batteries or pads. Besides the initial cost of the device, you may need to pay ongoing fees for support and management. However, these fees are not always required. If cost is a factor, you should search for AEDs that provide optional service charges. AEDs should also include a method for storing the device in a convenient location. Typically, these devices may come with a carrying case or a cabinet. You should try to place the AED in an area where it is easily accessed, such as the main hallway. The Philips OnSite AED was chosen as the best AED for churches due to its ease of use and overall quality. The device includes illustrated instructions that are easy to follow, even if you do not have any first aid training. Unlike some of the other AEDs, the Philips OnSite AED does not require you to pay a monthly or annual fee for management options. However, you do have the option of purchasing separate management software. The OnSite AED also includes a wall-mounted cabinet for storing the defibrillator in a convenient location. The cabinet also includes an alarm that will go off when the AED is removed, alerting others to the emergency. The versatility of this AED is also great. While it comes equipped with adult SMART pads, you can also install infant/child SMART pads. The pads are replaceable and cost between $50 and $100, depending on the type and the latest sale price. The overall ease of use is also a great reason to consider buying the Philips OnSite AED. This device guides you through the entire process with step-by-step voice commands. It also performs an automatic check of the patient to ensure that defibrillation is necessary. The Philips OnSite AED possesses many great features. However, the features that we like most include the visual instructions, the step-by-step voice commands, the wall-mounted cabinet, and the daily self-tests. The visual instructions and the voice commands ensure that anyone can use this device. You do not need any advanced training to follow the guided program. You also have the option of switching to a training mode, allowing users to test the device before they need to use it for a real-life emergency. The wall-mounted cabinet is also great. It provides a secure storage location for the AED and includes the necessary hardware to mount it to a wall. The AED also uses daily self-tests to ensure that the device is always ready for use. Most users will struggle to find any drawbacks to purchasing the Philips AED. It is the most-recommended consumer AED. However, some churches may not have the funds to purchase this expensive device. The OnSite AED costs over $1,000. The second potential issue is the cost of the replacement parts. Replacing a battery can cost over $100, while the pads can cost $50 or more. While the cost may be a disadvantage, you need to remember that this device is designed to save lives and is performing a very specific operation. The Philips Onsite AED is the top choice for churches and other public locations that require life-saving equipment. 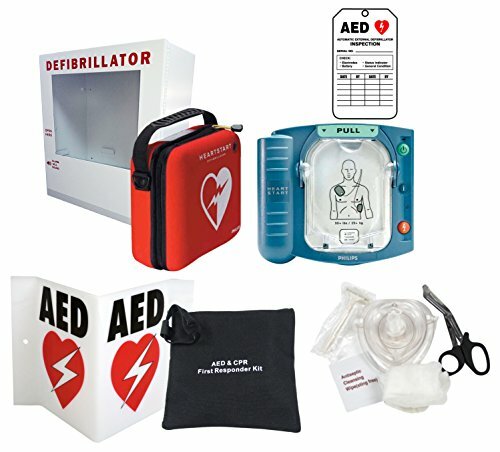 This package includes everything that you need to perform defibrillation on a person suffering from cardiac arrest. The pads and battery already come pre-installed, allowing you to instantly start using the device. It also provides several features designed to simplify the defibrillation process. These features include a voice-guided program that offers step-by-step instructions to coach you through the process. The instruction manual also provides visual instructions. Along with the ease of use, the OnSite AED is easy to store. It comes equipped with a wall-mounted cabinet that you can place in a hallway, closet, or other location where you can quickly grab it. The only potential issues are related to the cost of the device and the replacement parts. However, it is hard to put a price on a device that may save the life of one of your church members.